Anthony Knockaert scored a late consolation goal for Brighton as they fell to a 2-1 defeat to Tottenham in this evening’s Premier League encounter at the Amex Stadium. Anthony Knockaert was one of few ‘bright sparks’ for Brighton this evening with Chris Houghton’s side surrendering possession to Tottenham all to easily for the most part of the game. Brighton were much better in the second half although they simply started creating chances too late, had they have taken the game to Spurs earlier they may well have came away from today’s game with something to show for their efforts. 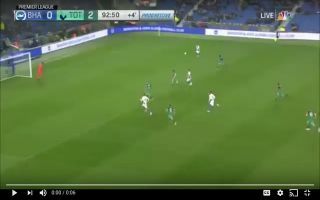 Knockaert scored a great goal in the 93rd minute of the encounter after Brighton shifted the ball high and wide Knockaert latched onto the ball and ran at the Tottenham defence. Danny Rose attempted to track his man back after deciding to play further forward so late in the game. In his attempts to track back Rose comically fell down leaving Knockaert free to take a shot at goal. Danny rose don’t deserve to be in this team. He does so many mistakes (as on Brighton goal). The same for Davies and vorm. ?? ?…Danny Rose showed y'all today that he is trash.? Good result. Great 1st half, crap 2nd half. Why oh why can we not keep a clean sheet? 1 minute left & Danny Rose is halfway inside the Brighton half! Need to improve our game management. A lot!!! One question, why with 5 mins to go and 0-2 up was Danny rose so far up the pitch somebody please tell me am I being critical or am I right? Can’t wait to see Danny Rose out of position and chasing back leaving Messi with all the space in the world ?